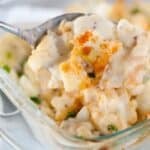 This simple Cauliflower Cheese Casserole recipe is an easy Easter side dish perfect for entertaining. 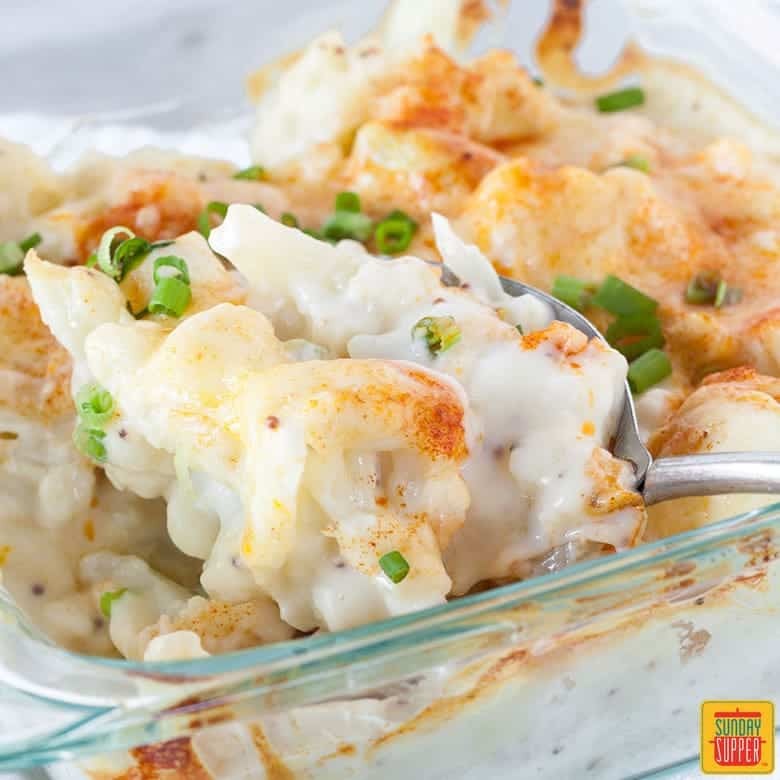 A quick and easy recipe to make, this simple cauliflower cheese casserole recipe is oozing with creamy cheese. Crunchy on top, smooth and creamy on the bottom! A great seasonal recipe! I feel like cauliflower is an underrated vegetable. Do you know how versatile it is? I personally LOVE roasted cauliflower, and any form of baked cauliflower really! But smother it in the most beautiful cheesy sauce and you’ve got me! I love making simple recipes that taste amazing! Cooking doesn’t have to be over complicated, in fact, you can find SO many recipes that use basic ingredients, yet still taste amazing! 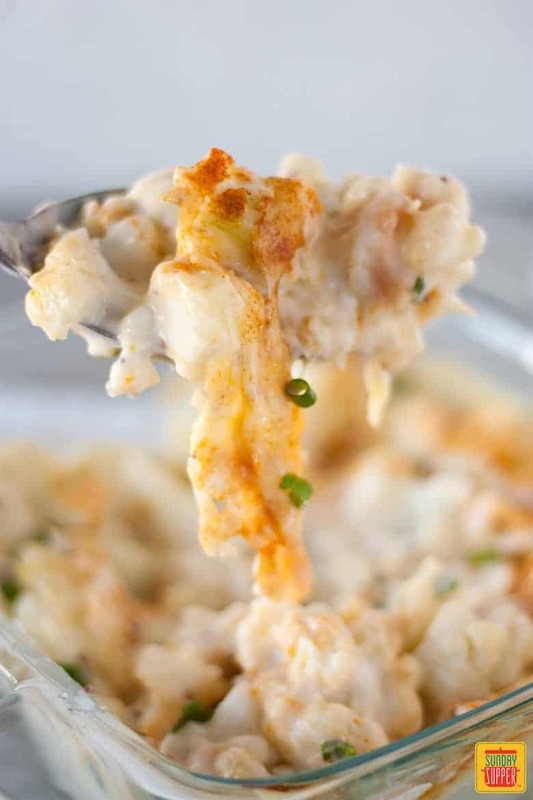 And this simple cauliflower cheese casserole recipe is no exception! When I look to make recipes for my family, I always choose recipes that I know a) won’t take me long to make, and b) will be simple, yet delicious. There is nothing worse than spending all your valuable family time together, standing over the stove watching something cook, or spending your time making something overly complicated. Family time, especially around Easter time should be spent catching up, laughing and having fun, not stressing about overly complicated dinner arrangements! The base of this recipe is 100% the white cheese sauce. For ages, I dreaded making white cheese sauce. For some reason they always felt so overly complicated, but a few simple tips from my husband (he’s a darn good cook), meant that I was able to easily master whipping up a simple, delicious white cheese sauce! Start with the melted butter, then add the flour and whisk until the flour starts to cook off. It’s it’s too dry, add a touch more butter, if it’s too wet, add a touch more flour. Next, add the seeded mustard. The seeded mustard gives it a beautiful flavor that’s just a little distinct to keep the white sauce interesting. You’ll want to fry off your dough for a few minutes and use a wooden spoon to really combine the flour, mustard, and butter. Next, slowly add the milk and whisk together. If lumps start to form, use your wooden spoon to gently squash them out. Continuously stir the mixture, as the milk starts to heat, the sauce will start to thicken. You want this sauce relatively thick, but remember it does thicken out when you add the cheese. This process usually takes about 5 minutes, over medium to high heat. Your last step is to add the cheese – I use a combination of mozzarella and cheddar because I like the sharpness of the cheddar and the consistency of the mozzarella. Always season with salt and pepper to taste! That’s really all there is to it! White cheese sauce is really easy to make and can easily be done in under 10 minutes! 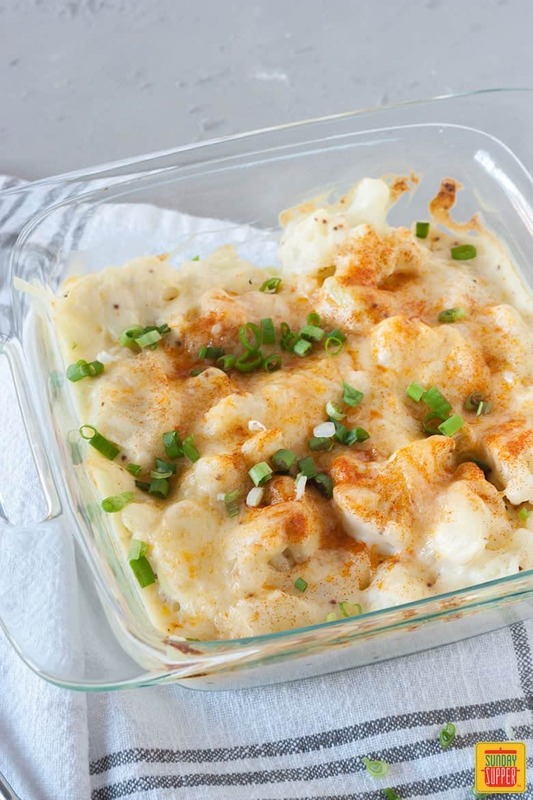 If you love cauliflower cheese, you’ll love these other side dishes! This 5-minute salmon dip is perfect for a Good Friday get together! Honestly, the best oven baked fries you’ll ever taste right here! This tomato casserole recipe would be great for a crowd! Place cauliflower florets in a steamer, and steam over high heat for 10 minutes, or until just soft (al dente). To make the white cheese sauce - melt butter in a small saucepan. Add flour and stir with a wooden spoon, 1 minute. Add seeded mustard and fry the flour 3-4 minutes, until dough is starting to cook. Slowly add milk and whisk until thickened - about 10 minutes. Once thick, add cheese and whisk until cheese has melted. Strain cauliflower and place in an ovenproof dish. Pour over white sauce and very gently stir until cauliflower is coated in sauce. Sprinkle over extra 1/4 cup of cheese and ground paprika. Bake 20 minutes on top rack, until sauce starts to go brown and cheese bubbles. Serve with sliced green onions for garnish. What a comforting side and the addition of mustard sounds fab! What a wonderful thing to do to Cauliflower!